*things may not always be witty. 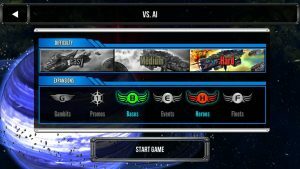 It’s Star Realms. You can cross the streams here if you want. 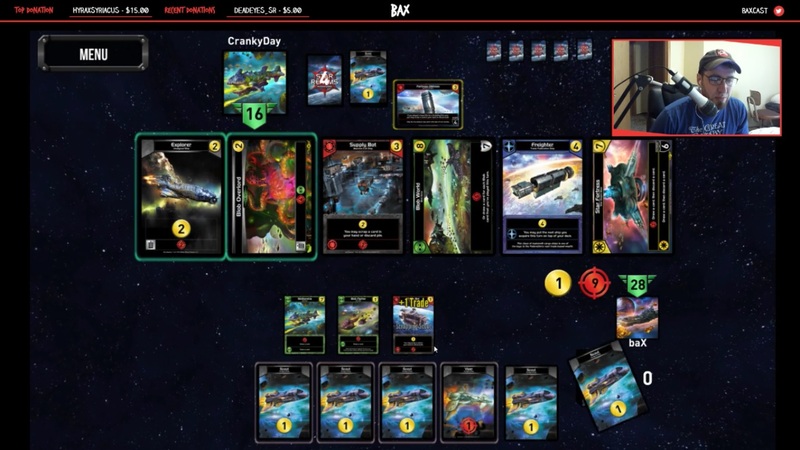 In today’s I Streamed a Stream, we meet a prolific Star Realms streamer who comes highly recommended by the community. First off, what’s your name and where can we see you stream? 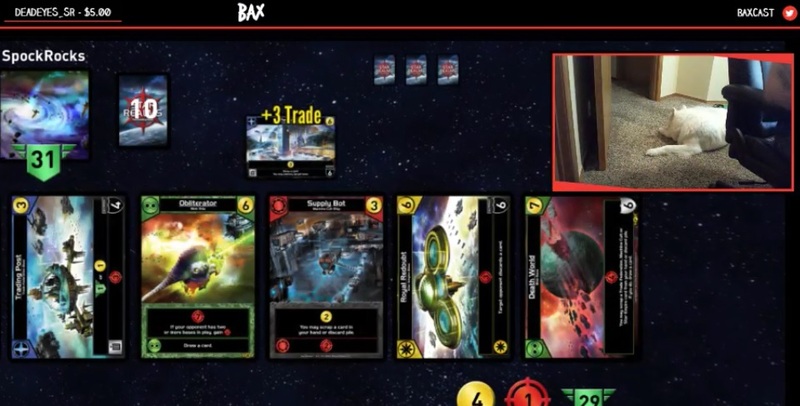 The name’s baX and you can find my antics at http://www.twitch.tv/hbax11. What’s the significance of baX? How did you get the name? One of my first jobs was working nights at a telemarketing firm in Boise, Idaho. Each employee had a a 4-letter company ID, and you used this to login and track your sales, calls, and disposition tallies. My assigned letters were “HBAX”. Each night, for one hour, they would have ‘Flick Sale’ competitions. During the hour, every subscription sale you got you would hold up these small notepads and flick them, which made a distinct noise to alert the supervisor without being so obtrusive that it interrupted other calls. They would then write your ID up on the whiteboard and give you a tally. The top two sales totals at the end of the hour received raffle tickets. Raffles happened at the end of every month for movie tickets, coupons, a frozen turkey, you know, things and stuff for raffles. My ID was up on the whiteboard enough that, for ease of use, they dropped the “H” and started calling me BAX. baX’s stream sometimes features DogCam! Do you stream other games? 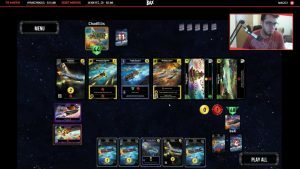 I’m currently expanding my game-list for streams, but Star Realms is the #1-seed in my “games-I-stream” bracket. I’ve streamed Rocket League a few times and a few other games I play will start to work into the rotation, hopefully in more prominent roles. 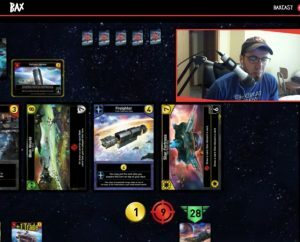 When do you usually stream Star Realms? 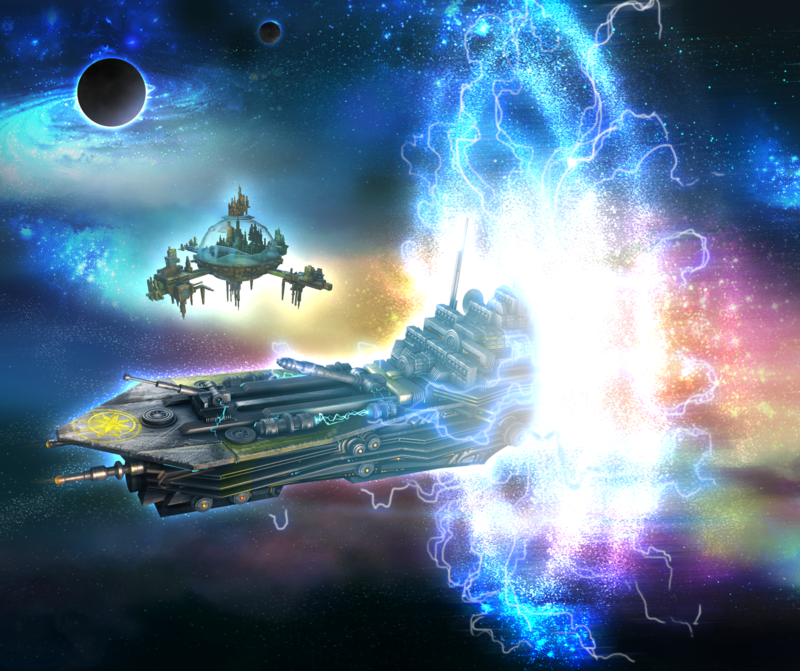 Starting now, Tuesdays and Thursdays from 9:00AM (PDT) – 10:30AM, and Wednesdays from 7:30PM (PDT) – 9:00PM. Other stream times, such as weekend streams or themed events, might be separate from those times. Same goes for other games. What’s the card that you buy no matter what? Like even if it’s a terrible idea. There might be some video evidence out there of me not taking the Imperial Frigate, but it’s fake news. 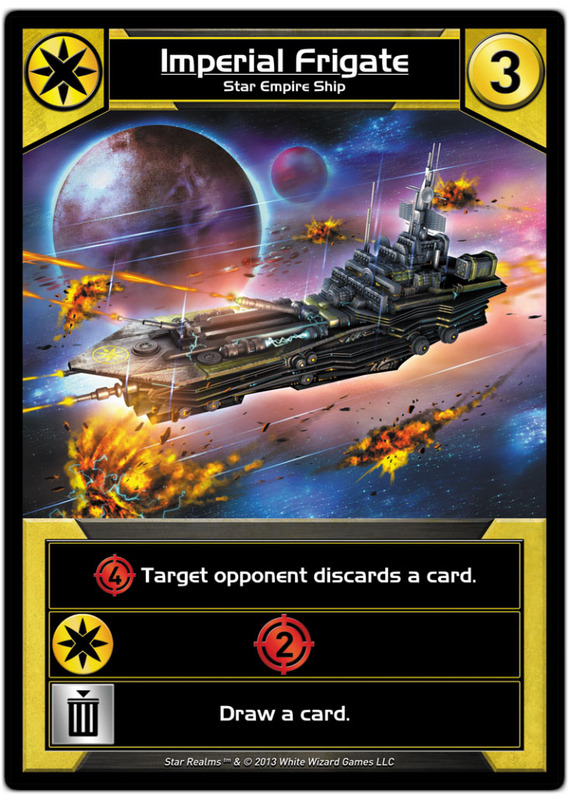 The only time I wouldn’t take Imperial Frigate is if the purchase directly contradicts my deck’s overall strategy. Most of the time, my deck’s overall strategy is to acquire more Imperial Frigates so it works out. All glory to the Empire baX! Assuming there’s no obvious direction in the Trade Row, which faction do you tend to chase? In order of priority, I’ll chase Machine Cult and then Star Empire. As an overall idea, I want to build Red/Yellow decks as often as possible and there’s a widespread stigma against Star Empire that let’s me build up discard control early which hurts opponents twice as much late game. Machine Cult feels slightly obligatory as an option because a deck’s cycle speed is not only crucial to general success in all formats but it’s also crucial to the success of Star Empire decks. 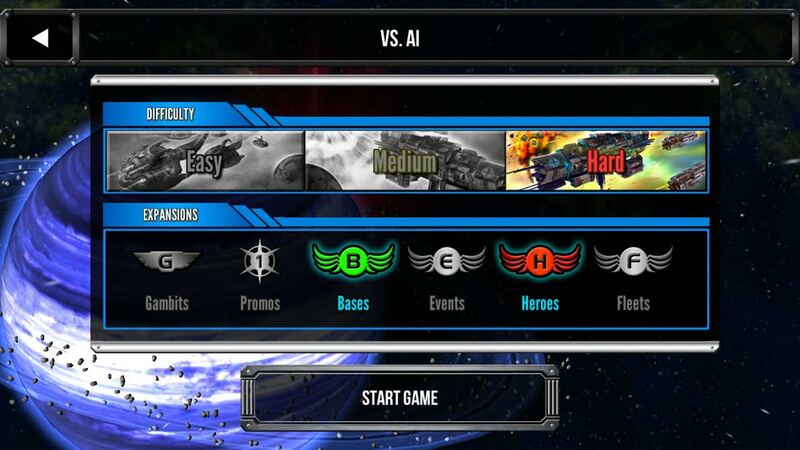 If I have the opportunity for a cheap R/Y startup, like Trade Bot and two Imperial Fighters, I’ll rarely pass it up. 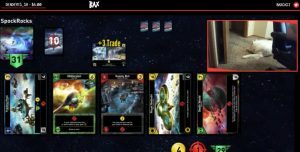 Do you have a preferred mix of expansions? The thing I love most about this mix is the added amount of draw and scrap-for-ability options. Decks move faster and most games, you can pivot to a new archetype halfway through by dumping 3 or 4 early purchases, which also increases cycle speed. For me, that usually means hitting my opponent with more damage and more discards more often. And that’s worth it. I get a kick out of Rocket League, but the community can be pretty harsh. That led me and a few others to start a discord community built around a fun tournament scene and communal encouragement to bring people together and help improve skill level. That’s the most important aspect for me in current gaming culture: fighting a consistent toxicity and anonymity that’s seeping into the framework of digital competition. I’m also playing Overwatch and Starcraft2. Blizzard and I go way back. 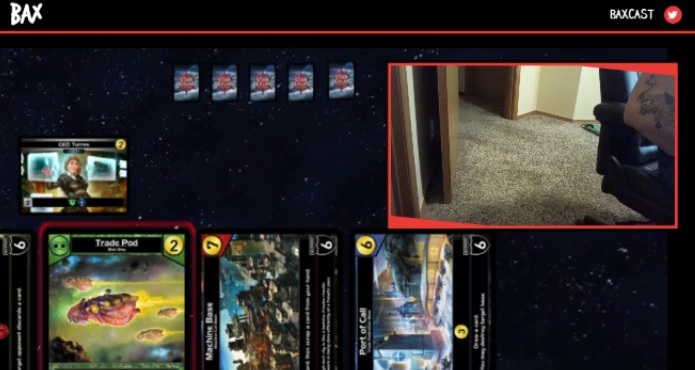 From the tabletop, I’m learning Netrunner: Android right now, which seems deviously delightful. My wife and I have a lot of fun with the new Star Wars: Destiny CCG and look forward to the next expansion release soon. ChadEllis is a longtime friend of Rob and Darwin. baX don’t care tho. He’s going down. 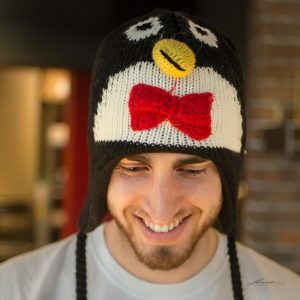 What makes your stream different from other streamers? My viewers could probably answer this better than me. I’ll give it a shot. I make a point to be active with viewers, which other streamers can neglect. I’m streaming for the people, it’s the connection that’s worth the effort, to have a mutual experience that everyone can be excited about. When I stream tournament matches for Star Realms, although I don’t interact with chat to maintain legitimacy, I’m streaming for the viewers, for the record book so people can comb through and have a discussion. That’s my goal, just like the previously mentioned Rocket League community: bring people together. When I’m streaming, you can expect intensity, because that’s my personality. I get excited about good plays and I get silly about bad ones. I talk trash and take trash. I want the stream to feel alive and as I continue expanding, that should be more and more prevalent. Also, you never know when my jokes will be funny. It’s a cliffhanger every time, you gotta stick around to see if you’ll be laughing at me or with me. Because I laugh at my own jokes. And they tell me I have a good voice for speaking into a microphone. That helps! The Face that Realms the Place! The first game I remember playing was this Bugs Bunny game, I think it was called Crazy Castle, on the original Nintendo console. The goal was to collect all the carrots on each map while enemies patrolled the different floors. I love-hated that game. It stopped being fun the first time I played and morphed into this perpetual challenge staring at me from the game box next to the television. I never beat it. This is what happens when you’re haunted by the memory of Bugs Bunny in Crazy Castle. Excluding games we make, what’s your favorite game (online or offline)? Half-Life 2 takes the top spot, but Starcraft is grabbing its heels. Starcraft plays the nostalgia card as the game that got me gaming, while Half Life 2 is the best overall gaming experience I’ve had. What was your finest moment in gaming? I have this one moment that really stands out everytime I think about my best personal gaming moments and it’s a bit of a story. Bear with me. I was on a team called “dotK” competing in CEVO-Main League, it’s the last game of the season and we have a 9-6 record. If we win, we guarantee a playoff spot for a chance at the professional league. If we lose, we’re done. The first team to win 16 rounds is the winner. Our last game is against one of the top 5 ranked teams. They had two players on their team who had professional level experience and by the projections on the website, we were a heavy underdog. They only lost two games all season, and those were to other top-ranked teams, and only by 2 rounds. One of their players had the best overall kill:death ratio of any player in the league. Our match is on de_season, a map we felt confident in, and to everyone’s surprise, we put up a fight. We were only down one round at half, 7-8, and after switching to ct side for the second half, we continued fantastic play, communication, and confidence to bring the game to an unbelievable tie 14-14, going into the final and deciding two rounds for a playoff berth. We were all so nervous before those rounds, I remember clapping my hands together in an attempt to encourage and distract myself from what might be the biggest upset in CEVO that season. I’m guarding the B-bombsite when the call comes in: they’re rushing the A site, hard. My B teammate rotates through mid and I run back through spawn to wrap around. Our team trades evenly on the push, 3 for 3, and I come into the bombsite from the top with a rifle. I walk in on top balcony, deadpan silence in the headphones, listening for footsteps ,for anything. My teammate picks up a kill in mid before dropping to the last player. Over comms, he says he’s running towards the A bombsite, right where I’m standing, waiting, sweating. 1v1 for the 15th round. I’m stuck in the back corner of the site and he’s not making any noise. By elimination, he probably has a good idea where I am and any moment, he could walk around the corner and kill me. No voices, no noise, the timer is counting down, he’s somewhere on the bombsite right now and I’m up against a wall hoping for a giveaway. And then, I did the silliest, best, dumbest, most beautiful thing I’ve ever done. I glance down and see an AWP on the ground where one of my teammates was killed. I pick it up. I go to the corner of the wall. I walk out onto the balcony, into the open, I scope in on a stack of boxes, and I fire. Watching the replay: he was crouching underneath a walkway waiting for me to make a sound or give myself away. And if I had missed, that’s exactly what I had did. Instead, with no notion at all of where he was, I shot him through the corner of a stack of boxes and through the edge of a metal plate on the walkway to get the kill and seal the round. It was the luckiest thing I’ve ever done in gaming. Do you have advice for anyone wanting to start their first stream? The hardest part is starting. It doesn’t have to be perfect, you can fix things along the way. Just go for it! Much thanks to baX for speaking with us. 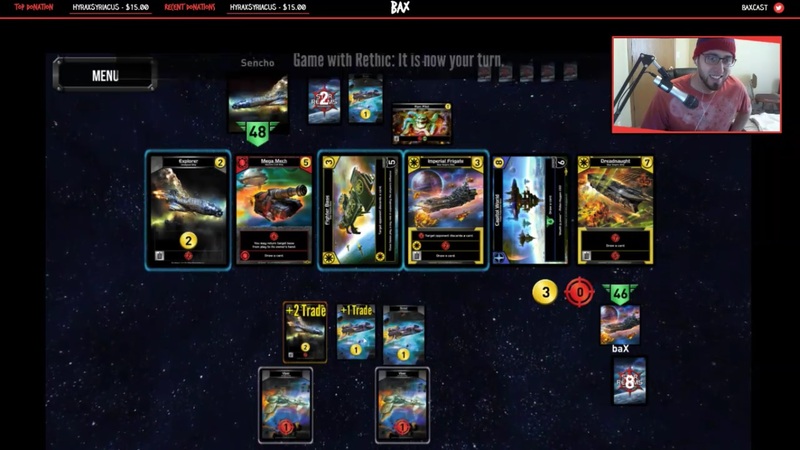 Please check out his stream, which is not only entertaining, but you might even pick up some of his baXiness. If you are interested in streaming, you can find guides here and here on how to get started. If you’re interested in being featured on a future I Streamed a Stream, email [email protected] and we’ll make you slightly more famous!